I'd Figure I'd follow in Josh foot steps and do a interview with my girlfriend/fiancee (soon to be wife) Karyn about a game that she is currently playing. Mind you now, this was done when she was half asleep on the couch, so I had to make the answers out of mubbles and blurbs. Me: What type of games do you like? Karyn: Ummm..I don't know..puzzle games. Me: What are you playing right now? Me: Why you playing it on a I-pod? Karyn: Yeah.........Its portable, small..I'm sleepy..
Me: How does it play on the I-pod? Karyn: Very limiting, cause you have to use the wheel, theres no up and down. The direction follows through on the wheel. Me: Is the awkward control just related to Mahjong or all I-pod games? Me: Do your games make you mad, like my games make me and I yell at pixelated characters who won't respond to my controls? Me: Do you think we are in over our heads with the flesh eating space monkeys? 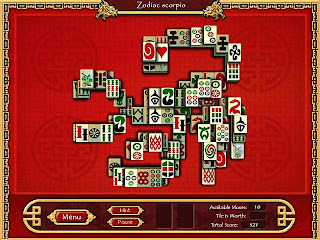 Me: What do you like about the game, Mahjong? Karyn: Its simple, mindless and a distracting. Me: What don't you like about it? Karyn: Theres no suped up levels like in Peggle. Right now I am doing the Emperors challenge, where I do a bunch of levels that unlock more levels. Theres no special power ups. Karyn: Some might care, but I don't. Peggle, now thats a fun game. I've played through that game 8 times now. 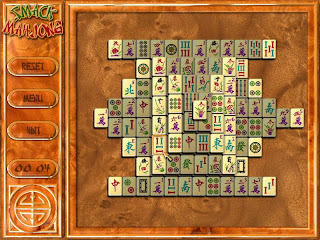 Me: Would Mahjong be better if you could shoot or kick the squares..AAAHHYAAAA!!! Karyn: No....It would be better if there were more challenges. Thats that. I don't play puzzle games. Karyn is more of a puzzle person. Life is a big enough puzzle for me, I don't need them in my games. Next from the i-pod, the talked about PEGGLE. And to get people excited about Mahjong, I made a trailer for everyone to enjoy. Thanks for the interview Karyn! sweet trailer! i WILL be the first to topple!!! how do i get that on my ipod? You download it from the I-pod store, any I-tunes has it I think. Your trailer made me think: If you don't play Mah-Jong, you might DIE!!! yes, infact.... your dead right now! !.......and you didn't even know it?!! !